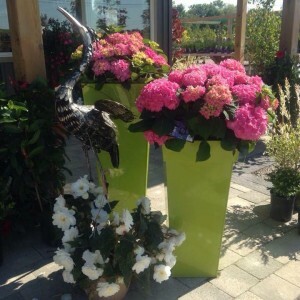 Let our passionate and knowledgeable staff help you in choosing the plants that are best suited for your garden. We have the area’s best selection of trees, shrubs, evergreens, perennial and roses. We go the extra step to maintain excellent, strong and healthy plants with daily care to make sure your plants will be enjoyed for years to come. Open from Spring to Fall, Gardening doesn’t have to be just May 24th weekend adventure. We carry an amazing selection through out the gardening year with new plants arriving on a regular bases therefore capturing what is hot and flowering in the moment. Needing a gift? Our Garden Centre has a variety of garden decor. The outdoor living space is just another extension of your home. Enjoy adding another concept to enhance your flower beds. We have the area’s largest selection of bulk mulches, river rock, peastone, various gravel, sand, screened top soil and triple mix soil. Bring your truck or trailer and we can load you up. We also have bagged mulches, stones and potting soils for those that need just a little touching up. All the above we can deliver so give us a call to set up delivery and times that can work for you. We are now open! Be sure to drop by and say hi. This year we have a number of new and interesting plants that have been just released. Looking for something different? We might just have that plant. Don’t forget to join our Facebook Page so you can get the latest on our weekly sales, new arrivals, and tips to make gardening much easier.